A very creative MTR rally by activists. Read more by Morgan Goodwin about the action. Editors Note: Information, Directions, Photographs, & Video will be updated onwww.climategroundzero.org throughout the day. Kayford, W.Va. – Hundreds of West Virginians and their allies will rally on Kayford Mountain and march from the Stanley Heirs Park onto the neighboring mountaintop removal site to plant trees on the surface mine. The rally begins at noon. Dozens of individuals intend to walk onto the mine site to plant trees on a “reclaimed” area of the site in an act of non-violent civil disobedience. They call for the abolition of mountaintop removal and thorough reclamation of the over 1 million acres flattened by surface mining in Appalachia. Standard reclamation involves regrading high walls into steep slopes and seeding the rocky soil with grass. The biodiverse mixed mesophytic forests of central Appalachia cannot regrow on reclaimed surface mines. The rally and action comes on the heels of the EPA’s recommendation to veto the Spruce No. 1 mine’s permit and Appalachia Rising, the largest national gathering of people in opposition to mountaintop removal coal mining to date. Appalachia Rising culminated with a march to the White House of over 2,000 people and 118 arrests for non-violent civil disobedience at the White House, PNC Bank, Department of Interior, and Army Corps of Engineers. I’ve written a number of columns in the University of Maryland student newspaper about the horrendous practice of mountaintop removal, in particular the Obama Administration’s failure to acknowledge the science behind mountaintop removal, a call for a ban on MTR following EPA regulations earlier this year which in hindsight were over-hyped, and an introduction to the practice and impacts of blowing up mountains for coal. Although I’ve participated in protesting a bank over funding MTR and taken part in a few campus educational events about it, I’ve never gotten a chance to directly witness the passion, fight, and energy of the movement stemming from Appalachia to stop mountaintop removal. That changed Monday, where I was fortunate enough to take part in one of the best organized rallies and fiercest urgent calls to action that I’ve seen in my years of environmental and climate activism. How many people were there? I don’t know, some people say thousands, others might guess lower, all I know is that there were a lot! I arrived at the beginning of the rally at Freedom Plaza, where I joined up with a few friends and listened as artists played music along with passionate demands for justice and action from the Obama Administration, along with condemnation of the coal companies for their monumental destruction. The speakers able to draw the best connection with the crowd and really define what’s at stake in this battle were coalfield residents who might not have been professional speakers, but spoke from the heart in a way that conveyed how dire the situation was to those like myself who are fortunate enough to have clean water and (relatively) clean air, something far too many of us take for granted. After the speakers were done we were led away from Freedom Plaza and marched towards the White House, with a couple of pit stops on the way. 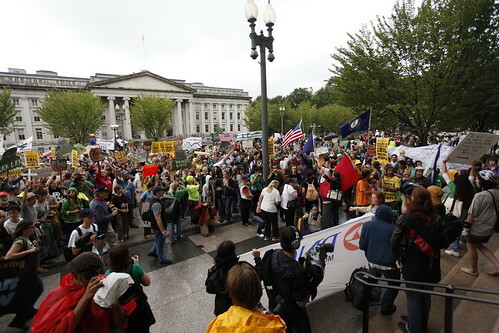 The first stop was at the EPA building, which in my opinion was the highest of many highs in this rally, as the energy that had been building up in the marchers for hours was unleashed. As leaders of the march and the movement stormed the steps of the EPA flanked by cameras, reporters, and security, a frustration and anger swept over the crowd (see photo), including myself. What the hell is the EPA doing? Certainly not its job, which is why the crowd chanted extraordinarily loudly “EPA do your job!”, so thunderously that if Lisa Jackson was in the building, her desk may have shook. More local coalfield residents spoke about how the EPA needs to regulate MTR because it’s poisoning their communities, and that Lisa Jackson needs to take a trip to Appalachia to understand the calamity being caused the corrupt politicians and their corporate coal masters. After the EPA building, we marched onward to the steps of PNC bank, where speakers highlighted how PNC bank is a top funder of MTR. It was great to see cameras flashing, security guards surrounding the entrance of the bank, and bewildered bank workers looking out onto the massive protest. There’s a saying that all press is good press. That quote was proven WRONG today. What PNC got on September 27th was definitely very very BAD press, which is what it deserves. Since PNC portrays itself as a green bank because of it’s building practices, it’s hopefully sensitive to this kind of negative attention, and will reconsider its policy of financing MTR. Next we marched to an area across from the White House for more speakers along with instructions for the civil disobedience that was to follow. One might expect a crowd to dissipate throughout the day, particularly with the rain that had been pouring on and off throughout the rally. Not this rally! If anything, the crowd grew as time wore on, to the point where I looked around when we got to the White House and realized that this wasn’t just a good turnout, this was a great turnout. Now came the moment of truth, where well over a hundred of the protesters in the rally marched over to the White House fence, risking arrest. The crowd watching stayed strong in numbers, chanting repeatedly alongside the soon to be arrested protesters. It took a real long time for the police to start arresting people, and even then they appeared to move very slowly, which I’m sure is owed to so many people risking arrest. Where were the police going to put all of them?! I stayed until the very end, taking part in many more chants, and cheering on as one by one the protesters were placed in handcuffs and walked (and in a few cases dragged) away. Many danced, egged on the crowd, and carried out the action right until the very end. The was one incident where it appeared the police were being too rough with a protester, which is unfortunate but it demonstrated how big this rally was, as hundreds of rally participants scrambled over to the side of the police tape where the incident was taking place. The police were forced to bring out officers on horses to push the crowd back and expand the perimeter. Despite being hungry(but hungrier for change!) and needing to finish work on an essay, I’m glad I stayed for the whole event when I had only intended to march to the White House. Everyone who came deserves a high five, but everyone who stayed all the way to the end to forcefully support those risking arrest deserve two, it really made a difference. Needless to say, the protesters who got arrested deserve much more! The energy in large numbers displayed throughout this rally was truly impressive. The decision to hit the EPA for their inaction, PNC Bank for placing profit above people, and then President Obama for allowing this atrocity to take place under his watch was smart and strategic. Apparently some activists also visited the Interior Department. I have no doubt that those in power and big coal took notice of this day. I’m very proud to have been a part of it, and sense I will eventually look back on this day as a big stepping stone on the inevitable path to victory. But I know that before any of us can look back, we have to move forward. 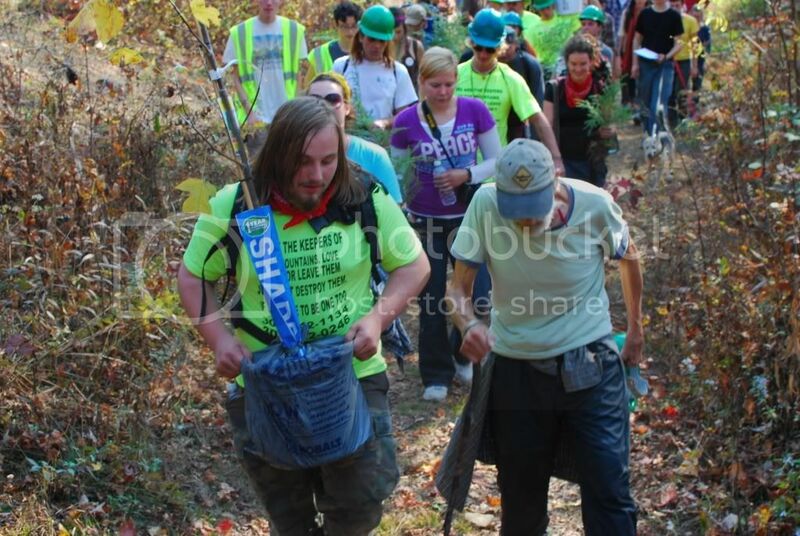 This was a great day of fighting for Appalachia. Despite living in Maryland, I know I can do better than one day of action, and I encourage everyone to step up their efforts to win this. I’ve been getting a lot of e-mail, and even some calls from friends about a mass mobilization this upcoming weekend to stop the horrendous practice of mountaintop removal coal mining. Below is a video from Appalachia Rising, as well as a description from their homepage detailing the activities that will be taking place this weekend. Although I probably will be unable to attend the weekend activities, my intention is to join in next Monday for the big day of action. Join us on September 25-27 in Washington, DC forAppalachia Rising!, a national response to the unmitigated destruction of Appalachia’s mountains, air and water through mountaintop removal coal mining. Appalachia Rising! will follow a long history of action for a just and prosperous Appalachia. 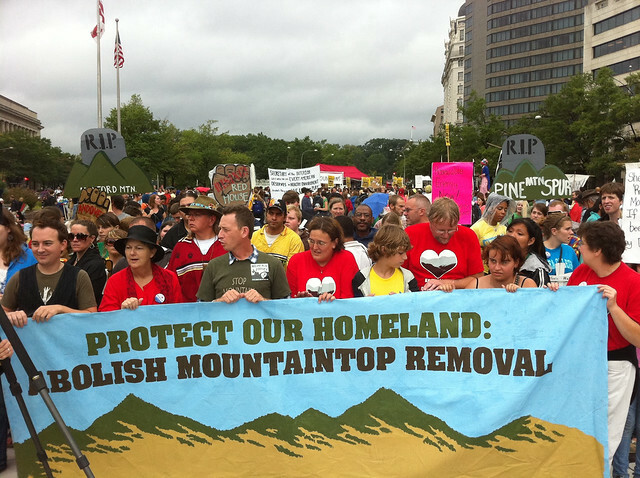 Converging in our nation’s capital, Appalachians, grassroots groups, individuals, and national organizations will call for the abolition of mountaintop removal coal mining and demand that America’s water be protected from all forms of surface mining. Appalachia Rising! will consist of two events. First, the weekend conference, September 25-26, Appalachia Rising! Voices from the Mountains will provide an opportunity to build and join the movement for justice in Appalachia through strategy discussions and share knowledge across regional and generational lines. On Monday, September 27, the Appalachia Rising! Day of Action which will unify thousands in calling for an end to mountaintop removal though a vibrant march and rally. An act of dignified non-violent civil disobedience will be possible for those who wish to put their sentiments into action by risking arrest. Join us, and stand in solidarity with the people of our Appalachian Mountain Communities, who won’t stand idly by as their land, water, and health are blasted and poisoned away. Donate to the activists legal defense. The epic fight to ward off global warming and transform the energy system that is at the core of our planet’s economy takes many forms: huge global days of action, giant international conferences like the one that just failed in Copenhagen, small gestures in the homes of countless people. But there are a few signal moments, and one comes next month, when the federal government puts Tim DeChristopher on trial in Salt Lake City. Tim—“Bidder 70”– pulled off one of the most creative protests against our runaway energy policy in years: he bid for the oil and gas leases on several parcels of federal land even though he had no money to pay for them, thus upending the auction. The government calls that “violating the Federal Onshore Oil and Gas Leasing Reform Act” and thinks he should spend ten years in jail for the crime; we call it a noble act, a profound gesture made on behalf of all of us and of the future. Tim’s action drew national attention to the fact that the Bush Administration spent its dying days in office handing out a last round of favors to the oil and gas industry. After investigating irregularities in the auction, the Obama Administration took many of the leases off the table, with Interior Secretary Ken Salazar criticizing the process as “a headlong rush.” And yet that same Administration is choosing to prosecute the young man who blew the whistle on this corrupt process. #Outside the courthouse, there will be a mock trial, with experts like NASA’s Jim Hansen providing the facts that should be heard inside the chambers. 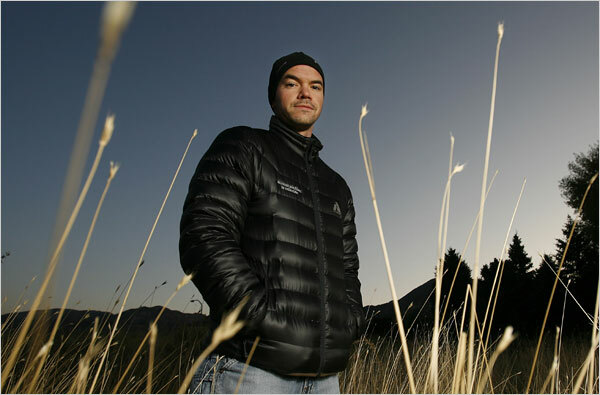 We don’t want Tim on trial—we want global warming on the stand. #Demonstrators will be using the time-honored tactics of civil disobedience to make their voices heard outside the courthouse in an effort to prevent “business as usual”—it’s business as usual that’s wrecking the earth. #There will be evening concerts and gatherings, including a “mini-summit” to share ideas on how the climate movement should proceed in the years ahead. This is a people’s movement that draws power from around the globe; for a few days its headquarters will be Salt Lake City. You can get the most up-to-date news at climatetrial.com, including schedules for non-violence training, and information about legal representation. If you’re coming, bring not only your passion but also your creativity—we need lots of art and music to help make the point that we won’t sit idly by while the government tries to scare the environmental movement into meek cooperation. This kind of trial is nothing but intimidation—and the best answers to intimidation are joy and resolve. That’s what we’ll need in Utah. We know it’s short notice. Some of us won’t be able to make it to Utah because we have other commitments or are limiting travel, and if you’re in the same situation, climatetrial.com will also have details of solidarity actions in other parts of the country. If you can contribute money to help make the week’s events possible, click here. But more than your money we need your body, your brains, and your heart. In a landscape of little water, where redrock canyons rise upward like praying hands, we can offer our solidarity to the wild: wild lands and wild hearts. Tim DeChristopher deserves and needs our physical and spiritual support in the name of a just and vibrant community. The Brushy Fork Impoundment is permitted to contain over nine billion gallons of the toxic coal waste, and currently contains 8.2 billion gallons. Brushy Fork’s foundation is built on a honeycomb of abandoned underground mines. If the foundation were to collapse the slurry would blow out from all sides of the mountain. According to Marfork Coal Co.’s emergency warning plan regarding the impoundment, in case of a frontal dam breach, a 40 ft wall of sludge, 72 ft at its peak height, would engulf communities as far as 14 miles away. “Brushy Fork sludge dam places the downstream communities in imminent danger. The threat of being inundated by a wall of toxic sludge is always present. Blasting next to this dam increases the risk as well as destroying the opportunity for renewable wind energy,” said Coal River Mountain Watch’s Vernon Haltom. According to the Coal River Wind Project, the wind energy produced by a turbine farm on Coal River Mountain could power 70,000 homes, provide more permanent jobs for local residents and annually bring over a million more dollars in tax breaks revenue to Raleigh County than coal currently does. The sitters plan to remain in the trees as long as it takes to stop blasting on Coal River Mountain. Climate Ground Zero’s action campaign, begun in February of last year, has kept up a sustained series of direct actions since that time continuing decades-long resistance to strip mining in Appalachia. There are a number of direct action protests taking place to protest what many activists see as lackluster negotiations that aren’t resolving any of the key issues over emissions targets, finance, or a legally binding treaty. Below is footage from a march on the conference center, and a youth sit-in inside. There is a live blog of the youth protest, which you can find here. I for one think it will be extremely interesting to see the end result of this trial, and I’m rooting for DeChristopher to be found in the right, although the odds appear stacked against him. “Mr. Yengich, a veteran of civil rights battles in Utah — he defended protesters against President Jimmy Carter in the 1970s and anti-nuclear activists in the 1990s — has asked Judge Dee Benson of Federal District Court to allow a so-called necessity defense at the trial. That would enable Mr. DeChristopher to argue that he faced a “choice of evils” that justified breaking the law. The interesting wrench in this case in my opinion is that after the Obama Administration took over, they deferred or removed the leases anyways because the methodology used by the Bush Administration wasn’t compliant with regulations, in other words, the law! Most of the leases were near national parks and monuments. “If convicted, Mr. DeChristopher faces up to five years in prison on each of the two counts and up to $750,000 in fines. Legal scholars say case law about the necessity defense, especially in civil disobedience or protest cases, usually requires that a complicated series of hurdles be cleared. Defendants must show that they faced a choice of evils: to break a law or to allow some other bad result to proceed. Part of the framework requires a judge, or a jury, to weigh how bad the result would have been, and for whom, if the defendant had not acted, and how imminent the harm actually was. “The evil you choose must outweigh the evil you avoid, based on some kind of objective judgment about what is the greatest social net benefit in the situation,” said Marc O. DeGirolami, an assistant professor of law at St. John’s University in New York. Even if Judge Benson prohibits a formal necessity defense, it is possible a consideration of Mr. DeChristopher’s intent, and thus a discussion of government impropriety, could seep into the proceedings. A witness who blurts out something about government failings or the threat of global warming could plant a seed of alternative interpretation — or doubt — in the minds of jurors. Anyone aware of the consequences of burning that oil and gas knows that DeChristopher chose the lesser of two evils. A ruling in this case in his favor could unleash a precedent for activists to use more aggressive direct action techniques to disrupt fossil fuel production and consumption, based on necessity defense and a “choice of evils”. The question is, is our nation going to jail people trying to save civilization, or those who are destroying it? Some of my peers frustrated by the lack of action on strong climate legislation, froze for 2 minutes in the cafeteria of a Congressional building today, which looks pretty creepy/awesome in this video. I had heard this was going to happen, the plan after 2 minutes was to drop some Aces on the ground and walk out since the abbreviation for the bill is “ACES”. I’m not sure if that happened, but at the end everyone yelled “stop climate change now”.